The Kewaunee Pierhead Lighthouse is located in Kewaunee, Wisconsin...halfway between Sturgeon Bay and Manitowoc along Lake Michigan. The attractive square tower is identical to the Holland Harbor Lighthouse, but is white in color with a red roof as opposed to Holland's red tower. The two-story building is 40 feet long and 15 feet wide. 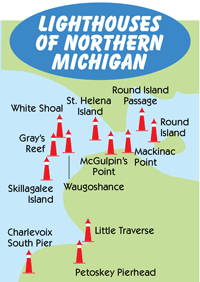 The City of Kewaunee is in charge of the lighthouse, which, like most lighthouses, has undergone many changes over the years. 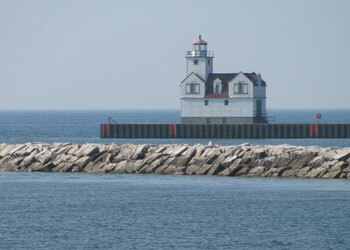 It was decided in 1850 that a pier should be built near the mouth of the Kewaunee River into Lake Michigan. That was done, as well as a second pier that was built in 1856 to serve the schooners and steamers that were using the harbor. A light was placed on the north pier, and in 1886, they erected a frame at the end of this pier and used a signal lantern with a red light. Then in 1889, an open framework tower was constructed on the end of the north pier that housed a sixth-order pierhead beacon. 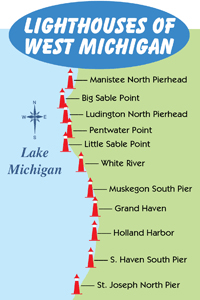 With heavy railroad carferry service between Kewaunee and Frankfort, MI...the need for an adequate harbor increased. The north pier was extended 300 feet and the tower moved 200 feet lakeward. In 1894 the tower moved again closer to the end of the northern pier and the construction of a fog building began. An elevated walkway was installed, as was the case with many lighthouses from this period. A keeper's quarters was erected in 1908 on the south side of the river. With the completion of a concrete south pier in 1912, more buildings were constructed to house a fog signal and pierhead range lights. The front light shone from a white square steel building, while the rear light was housed in a white skeletal steel tower. Finally in 1931, the white steel tower was removed, and a square tower with a lantern room atop the fog signal building was in place. Later between 1935-1937, most of the north pier was removed and a breakwater was built at the entrance to the river. The elevated walkway was removed in 1981 upon automation of the lighthouse. 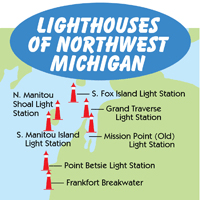 A fifth-order Fresnel lens is still in use on the Kewaunee Pierhead Lighthouse....one of only 6 used in Wisconsin. 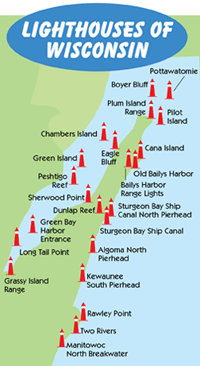 The diaphone fog signal, so familiar to residents and mariners in Keewaunee, was originally set to ship to the Smithsonian Institute. The TOOT (reTurn Our Old Tone) organization of Duluth, Minnesota managed to obtain it, rebuild it, and place it back into service on the South Breakwater Light. This particular sound was captured on tape, and placed in the National Recording Registry of the Library of Congress.